The end of the year went by quickly, the fall was busy with some travel. I was in Boston in October and right across from the hotel was Eatly. So before I had to leave, I did a quick tour of the store and picked up different kinds of pasta. I used one of them to make a pasta salad in the new year. It says on the packet that it is a Sardinian pasta . 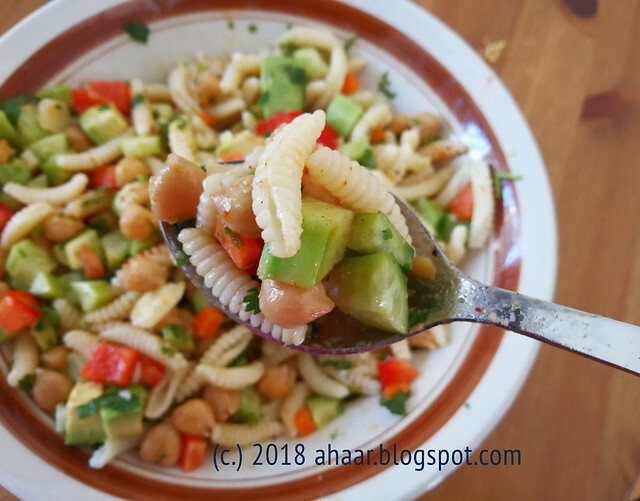 The shape and size was perfect for the salad, the kids called it a worm pasta and Aswin called it larvae pasta. Despite the name challenge, we all enjoyed it. Aswin and I ate the pasta salad which is really easy to put together. The kids ate a deconstructed version of the same salad - veggies, garbanzo beans and pasta separate. How about you? Hope your New Year is starting on a good note. The ingredients list may sound long, but it really depends on what you have at home. You can always substitute one vegetable or ingredient for another. 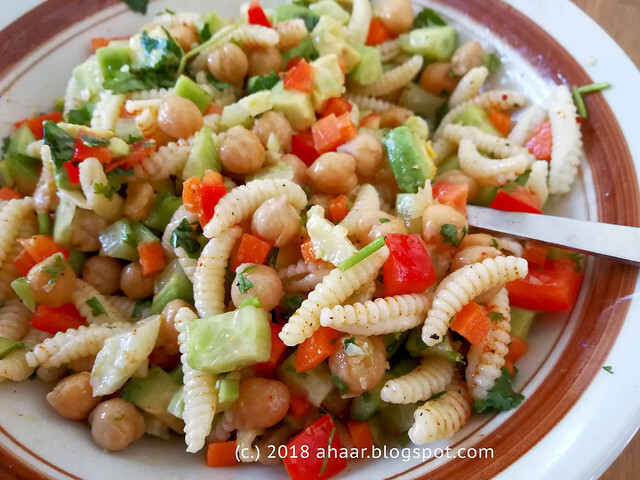 I made it as a warm salad (especially with the cold weather) by freshly boiling the pasta and garbanzo beans and mixing the vegetable in the still warm mix. I like to add the mix all the dressing ingredients separately, but you can also add them directly in the salad mix.